A U.S. Marine Corps veteran deported to Mexico in 2002 after being convicted of animal cruelty will be returning home Thursday, just in time for Christmas, a San Diego-based assistance group announced Monday. Gov. 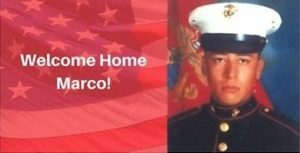 Jerry Brown earlier this year pardoned Marco Chavez and two other deported veterans, according to the Honorably Discharged, Dishonorably Deported Coalition, which assisted them in regaining their U.S. permanent residency status. Chavez’s green card status was restored in court earlier this month, according to Nathan Fletcher, chairman of the coalition. According to an announcement on the Coalition’s Facebook page, Chavez is expected to cross the U.S.-Mexico border Thursday, where he will be met by members of his family, coalition members and a representative of the ACLU. Chavez was born in Mexico and brought to California as an infant. He enlisted in the Marines at 19 as a lawful permanent resident. He was convicted in 1998 of animal cruelty, served 10 months behind bars, and was deported four years later as a result of the conviction, according to media reports. His family initially moved with him to Tijuana in an effort to stay together, and his wife, who did not speak Spanish, commuted daily to the U.S. for work. She and their three sons eventually moved to Iowa, according to reports. Chavez said his deportation “upended” his life, and he now has two grandchildren he hasn’t met yet. “With the restoration of my legal status, I feel like I’ve been given my life back,” he said.